I think my mother misses her children even more than usual during the holiday season. She has been making enormous meals, and buying the big costco packages of mushrooms and pretzels. Our two refrigerators are overflowing. Well today I found myself with much more energy than usual, and I decided I should clean out the refrigerator. I pried off the plastic light bulb cover, because some pancake syrup had leaked under it. I scrubbed at the syrup with my drippy rag. Too late I remembered all the dire “never drip water on hot glass” warnings my mom had ever given me. “Oh no!” I said. “Shut the fridge door!” said Mom, and I slammed the refrigerator door shut. I felt heroic, momentarily convinced that that light bulb was seconds away from exploding and sending poisonous blue gasses throughout the kitchen. In reality, Mom just waited for the bulb to cool down, and then removed it. 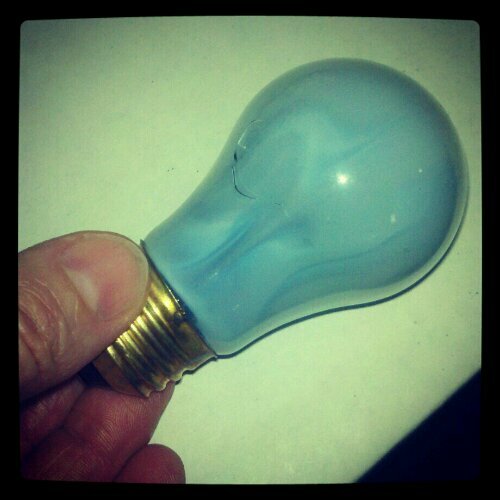 It did have a hairline crack in it, which resulted in the bulb turning blue. I don’t know why it did that. I think I’ll google it. Google offered me no solutions. But I did get this picture. I watched The Star of Christmas with Jenny this evening. Wow, I haven’t seen that movie in a very long time. I still remember getting it for Jenny and Ben for Christmas years ago. The whole family watched it and laughed and laughed, but unfortunately there was a glitch in the sound which made everything sound staticy. This time, there was no staticy sound. Which means that if you leave VHS tapes sitting around for long enough, their quality improves. Cool, huh? Ha ha. After my last post, Hans Shenk commented and said that I should just re-write the play and add more whooping and coughing. I thought this was so funny. I laughed and laughed, and then at school today I told the students about it. They sat in silence for a few seconds, and then one of them began fake-laughing just to mock me. But the good news is the two kids who we thought had whooping cough got tested today, and they don’t after all. So the play should go ahead as scheduled.